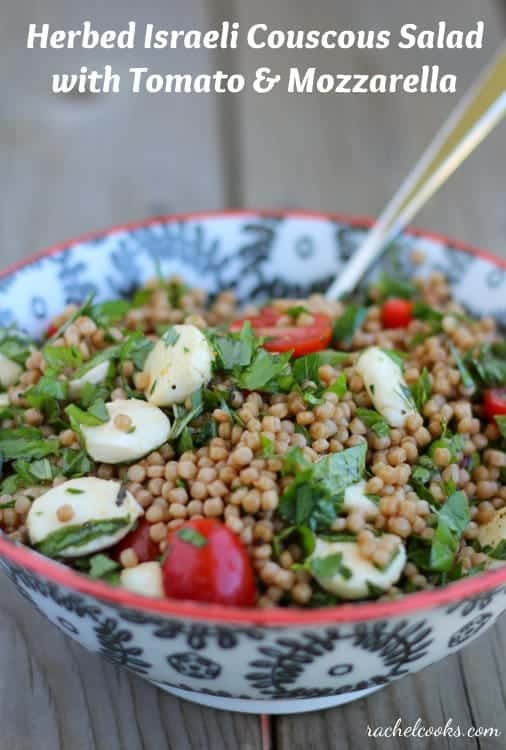 This Israeli Couscous Salad with tomato and mozzarella is full of fresh herbs. It will be a fantastic side dish for any great meal, or it could stand alone as a lunch. Today we’re celebrating Aggie of Aggie’s Kitchen and the little man she’s cooking up in her belly. I just love Aggie. As one of the first bloggers I “met” online, and one of the first to welcome me into the blogging community, she holds a special place in my heart. She had faith in me as a blogger before I did! I’m so excited to be participating in her surprise virtual baby shower today. Surprise, Aggie! I hope you’re wrapped in love today — you mean so much to all of us and we’re so very happy for you and your family. 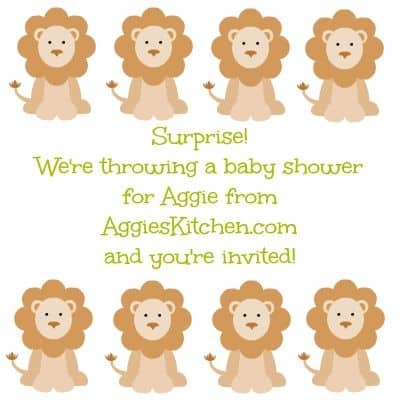 We’re throwing Aggie an Italian themed baby shower. So technically I guess Israeli couscous is, umm…Israeli and not Italian…but it’s pasta. Pasta = Italian. Just go with the flow okay? You could actually make this salad with any pasta that you like. It would be fantastic with normal couscous or orzo. It encompasses some of the best flavors of summer: flavorful herbs, fresh mozzarella, and juicy tomatoes. 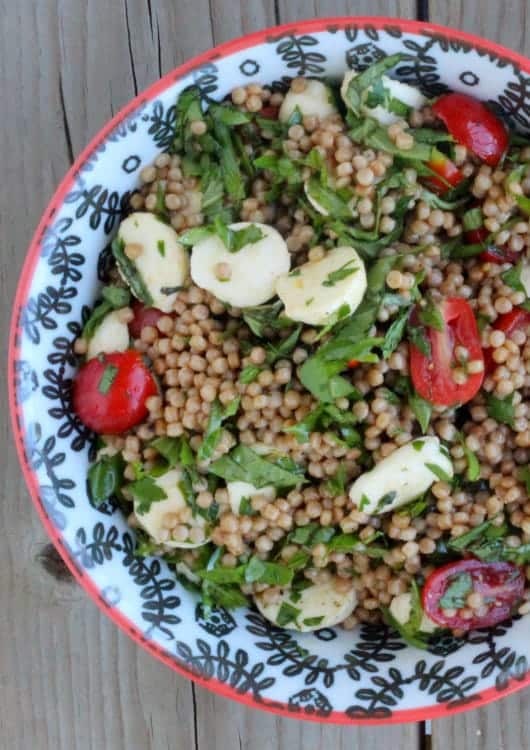 The whole wheat Israeli couscous gives a perfect nutty flavor and bit of chewy texture. I think you’ll love it! It’s also a perfect way to use of up your summer herbs. If you wanted to go with all basil, if could easily be reminiscent of a caprese salad. I chose to use lots of parsley in addition to basil because I love its fresh flavor. This Couscous Salad with tomato and mozzarella is full of fresh herbs. It will be a fantastic side dish for any great meal, or could stand alone as a lunch. In a medium saucepan over high heat, boil water. Add salt, 1 teaspoon olive oil, and couscous. Reduce to a simmer, cover and cook for 8-10 minutes, stirring occasionally. Transfer to a bowl and let cool. Add remaining ingredients, stir to combine. Best served immediately. Verdict: Loved this salad! I could eat it daily! Husband’s take: No complaints from hubby! Changes I would make: None are necessary but feel free to play around with different herbs! Craving more summer-worthy salads? 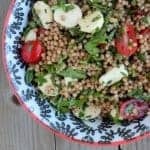 Try: Greek Pasta Salad with Feta, 2 Ingredient Dill Potato Salad, Asparagus Ribbon Salad with Beets and Burrata, Cucumber Ribbon Salad with Yogurt Herb Dressing, or Israeli Couscous Salad with Apples and Cherries.